Of all the many climbs up Big Cottonwood Canyon and so many favorites to choose from, here are four top favorite routes to climb on the great quartzite of BCC. 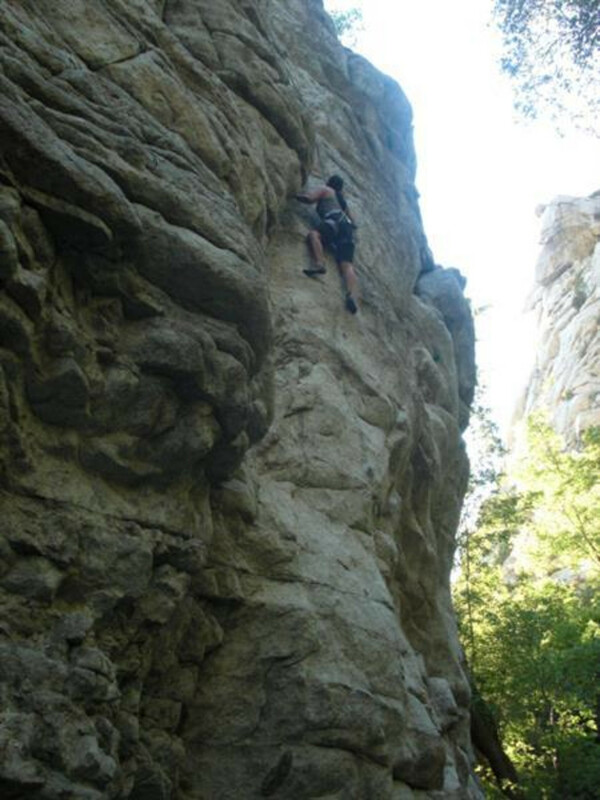 Big Cottonwood Canyon has a huge variety of climbing options with difficulty ratings that range from 5.4 to 5.13. The quartzite rock can take a bit of getting used to, but with this type of rock there are often abundant grip—great for beginner climbers. 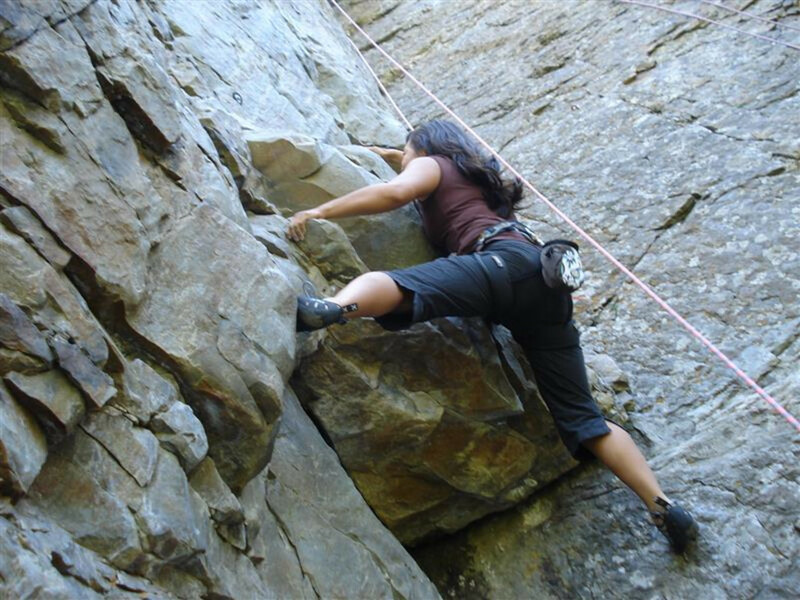 More experienced climbers can hone their skills with the overhanging climbs. While climbing in Big Cottonwood, be sure you have a good solid lead climber (some routes can be top-roped) and a trusted belayer. 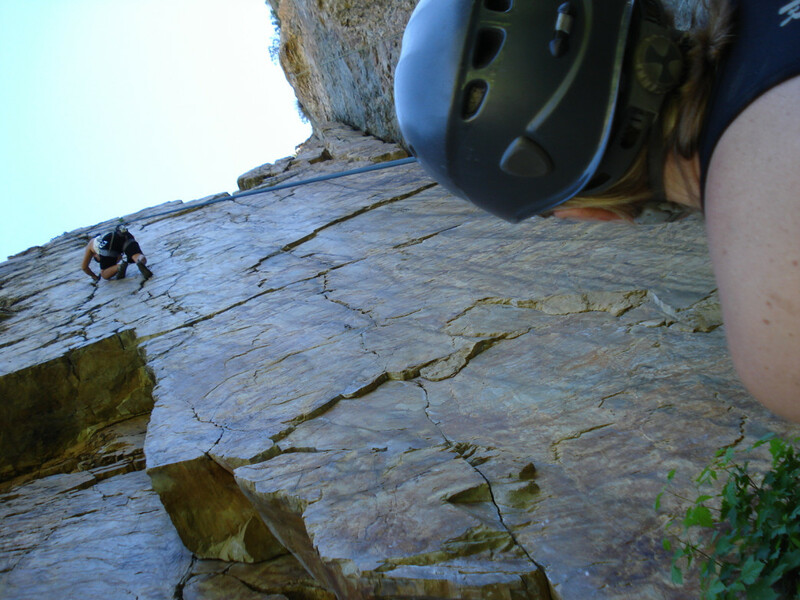 Here are four favorite climbs to take on in Big Cottonwood Canyon. Hollow Man is located on the Challenge Buttress West Wall and is a 5.9 route. 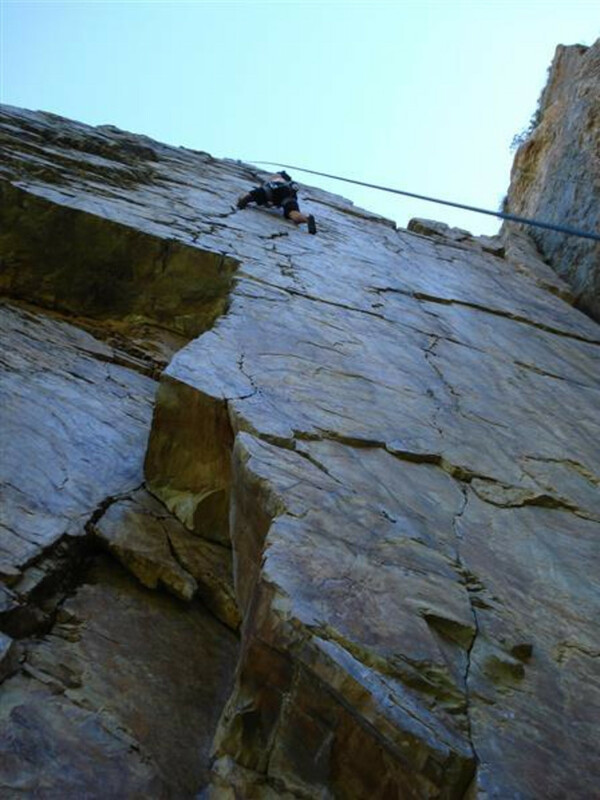 The climb is steep and slightly overhanging, but there are some great holds along the route. The slight overhang challenges a climber's forearms. Hollow Man is a difficult 5.9, but it’s a good introduction for those climbers that want to slowly ease their way into climbing more overhanging routes. Chambered Nautilus is also located at the Challenge Buttress wall, but this climb is on the east face. The 5.10a route is to the right of Coral Bells Arete and climbs the north overhanging face. There are a couple of roofs on this climb—the first is at the very beginning. The hand-holds on the top of the first roof are nice and meaty, while the holds on the second roof aren’t quite as generous, but still aren’t extremely difficult. There’s a nice undercling on the roof closer to the top to get you stabilized and over the roof. The approach is the same as Hollow Man, but you’ll take a left at the fork of the trail. Goodros Wall is a classic Big Cottonwood Canyon route. This is a 5.10c trad route, so bring a standard rack of nuts and cams up to two inches. The route looks like a giant, polished marble slab. At the beginning of the climb, you go up a slightly overhung wall then make your way out to a magnificent crack. The crack has some super hand jams and is somewhat pumpy, but the views and the route alone make it all worth it. Skinny Len Crimps is a 5.11a route located in Ferguson Canyon—just before the entrance to Big Cottonwood Canyon. This crimpy face wanders a bit to the right of the bolt line and has some bold features that make it feel somewhat like a bouldering problem at first. If you go straight up the route without going a bit to the right, the climb becomes harder, possibly a 5.12a. If you’re a fan of crimpers, this is the climb to do. 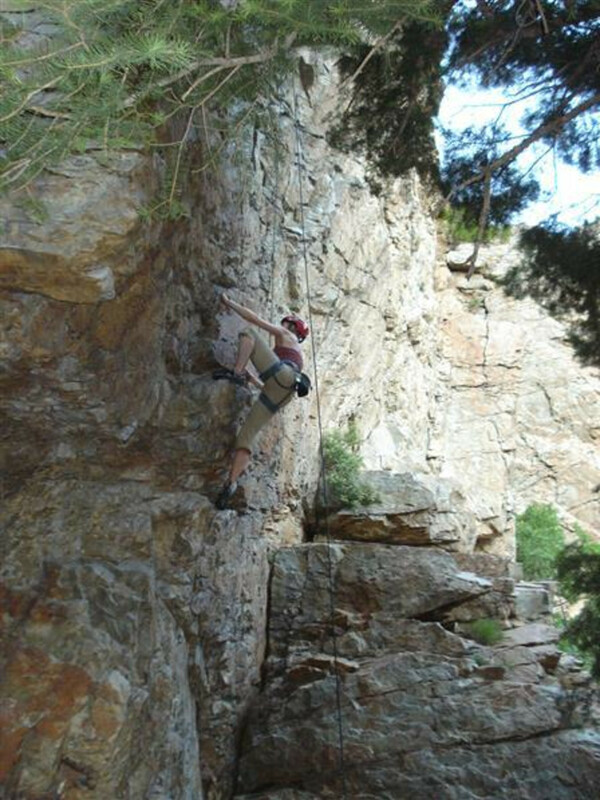 With its wide range of difficulty levels, Big Cottonwood offers something for everyone. As with any area, however, you’ll want to make sure that beginners have the basic skills—a trip to the local gym is a good idea before first-timers attack real rock. Head up Big Cottonwood Canyon 2.5 miles from the neon sign to reach the Challenge Buttress. The pullout is on the north side of the road (at the south end of the Dark Star Gully) about 100 yards down canyon from the Storm Mountain Picnic Area. The approach is short and doesn’t require much effort. It’s a scramble up a steep embankment just above the road on the west side of Stair’s Gulch stream. A trail from here leads through the trees up to the crag where it forks. The right path will lead you to the Challenge Buttress West Face. Head up 2.85 miles up the canyon from the neon sign to the Storm Mountain Picnic Area. If you park across from the picnic area, you will avoid having to pay a user’s fee of around $8.00. Walk to the spillway of the dam and cross the river on the bridge. Turn left after the bridge then take the right fork until the trail passes several small boulders between two picnic tables. Turn left (south) and head up the talus to an easy third class corner that accesses the route. From the intersection at the mouth of Big Cottonwood Canyon, drive a quarter-mile south along Wasatch Blvd. to Prospector Drive (7535 South). Prospector is on the east side of Wasatch Blvd. Turn onto Prospector and drive up the hill to the south, past Quicksilver then turn left on Timberline (7780 South). Park by the gate that blocks access to a dirt road to the east. The dirt road leads up to a white water tower where it turns into a trail that descends down to the canyon bottom. The first buttress on the south side of the canyon is the Watchtower wall. Pass the Watchtower wall and the next obvious cliff on the right – the one with an overhanging north face – is the Cathedral where Skinny Len Crimps is located. There are no fees for either driving up or parking in Big Cottonwood Canyon. There are no open or closed hours, either. During the winter months, however, four-wheel drive and snow tires are often required.